After a full 36 hours of successful tenting, it was finally my turn to take my first shift sleeping in tent FF. For almost two full days we had the appropriate tent members on guard around the clock, and so far all was going smoothly for us. But nighttime tenting is a different story. Line monitors can call a tent check any time of day or night. Obviously during the day time that is not an issue as long as the one required tent member is present and attentive, but any time is fair game for a check, so group members always need to be on top of their game. For students it is the ultimate balancing act, they are forced into an extremely social setting (a large group of people living in extremely close quarters) during the time when many of them do their schoolwork, and have to try and get some sleep despite the possibility they’ll be woken up for a check. The five of us set out for K-Ville just before 11:00 when daytime hours (only one person required) officially turn over into nighttime hours (six members required) on weeknights, which are technically Sunday, Monday, Tuesday, and Wednesday. Keep in mind that yes, we are college students, Thursday counts as the weekend so different hours apply. It was a relatively warm evening- the night before had been in the 30’s, but the temperature last night was in the low 50’s, which was fantastic for a January night. We arrived at K-Ville just in time and met up with our sixth member for the evening who was just finishing his two hour shift leading up to nighttime. Typically there is always a check done while everyone is still awake, but anything after that remains to be seen. We decided to set up our sleeping arrangements inside the tent as quickly as possible so we would not have to do it late at night. The setup went quite smoothly, as we arranged our air mattresses and sleeping bags in a way that would make it conducive to people entering and exiting the tent without causing much disturbance. The first tent check came at exactly midnight. If you’ve never been to a tent check before, it’s basically impossible to miss a check unless you don’t have enough people there. A bullhorn pierces the night signaling the check and as you step out of your tent, you see a horde of line monitors with tent rosters ready to check names and IDs. The check lasts about 15 minutes as each line monitor is responsible for checking a handfull of tents, and tent FF passes once again with flying colors. After the check, the line monitors call grace for approximately one hour. On this night grace ended for us at 1:00 a.m. This means that we were free to leave K-Ville for that time if we wished. 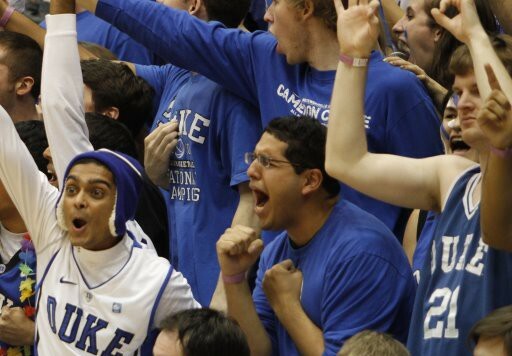 Grace is also called for the entire night if the temperature drops below 20 degrees or if there are more than two accumulated inches of snow, or for at least an hour before and after every Duke basketball game. Most people take them up on that offer, but as freshmen that live on East campus, there aren’t many places to go for an hour. Luckily for us, we found a pretty sweet spot to hang out in our free time. Where better to hang out for an hour with your friends than get some work done than next to all four of Duke’s national championship trophies? Luckily there are actually varsity athletes that are out tenting this season, and have full access 24/7 to the Krzyzewski Center for Athletic Excellence, which houses the Duke basketball museum. It’s a great place to hang out during grace time for freshmen who don’t have dorms they can run back to in fewer than five minutes. Unfortunately we do not have card access to the building at all times, but luckily for a few of my friends and me, as we walked up the ramp toward the museum a member fo the Duke fencing team had a similar idea and was able to get in. It was a nice relaxing hour sitting in the museum as all of Duke’s retired jerseys adorned the walls and the last few minutes of the 2010 national championship game droned in the background on repeat. Let’s just say it was probably the next most relaxing experience to spending the hour in Bell Tower’s Oasis. Of course what hour of grace would be complete without a late night snack? Most tenters use their free hour to go get some food. There are plenty of late-night options on campus, but tonight our choice was Jimmy Johns. 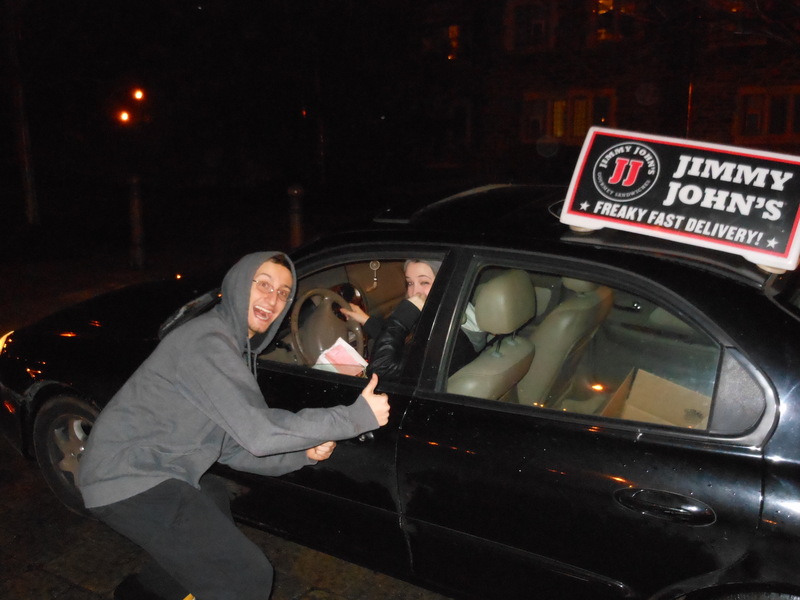 For those of you that have never been to Duke, late night Jimmy Johns is the staple of a Duke student’s diet. After walking to the edge of the curb on Towerview Drive to pick up our sandwiches, it was time to head back to the tent. Grace was finally over. Things slow down a lot in K-Ville after the first tent check of the night. Most students will retire to their tents where they will attempt to get as much work done or as much sleep as they possibly can. Clearly being in a tent is not exactly the most ideal sleeping scenario, but having a sturdy floor from our reinforced plywood helps to stabilize the structure and an array of air mattresses and inflatable pads seem to do the trick for the night. 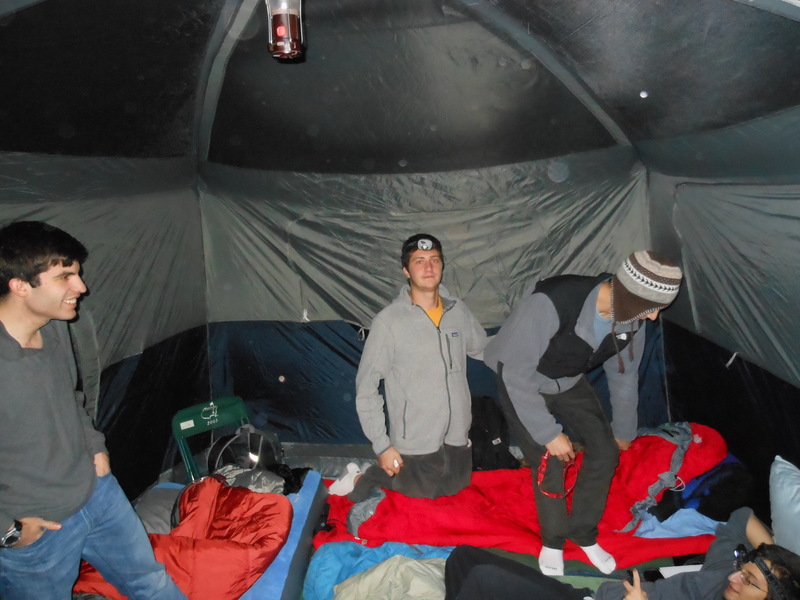 After hanging out with my six friends for about another hour in our tent, we decide it’s time to get some sleep. However, our slumber did not last very long. We awoke in the dead of the night to the wail of the familiar siren- it was time for another tent check. We scrambled to get everyone up and out of the tent as quickly as possible. Speed isn’t necessarily of the essence when it comes to a tent check, it’s not like we have 30 seconds to get out to the sidewalk, but knowing our sleeping habits as college students, it’s very easy to fall asleep if you don’t get up right away. K-Ville shakes itself awake as people begin to pop out of their tents, accompanied by a chorus of oh so familiar groans. None of us even know what time it is, so we ask one of the line monitors, who dont’ seem much more awake than we are, and they inform us that it is 5:30 a.m. Checks are known to happen in the middle of the night, at 2:00, or 3:00, or even 4:00 in the morning, but this timing seems a bit foreign even to the line monitors. 20 minutes later, we had completed our second tent check of the night, and once again we passed. Grace is normally given for an hour, but the line monitors were willing to give us grace until 7:00 on one condition, we had to sing happy birthday to one of the line monitors (apparently it was his idea to call the 5:30 check on his own birthday, none of the other line monitors seemed to know why). 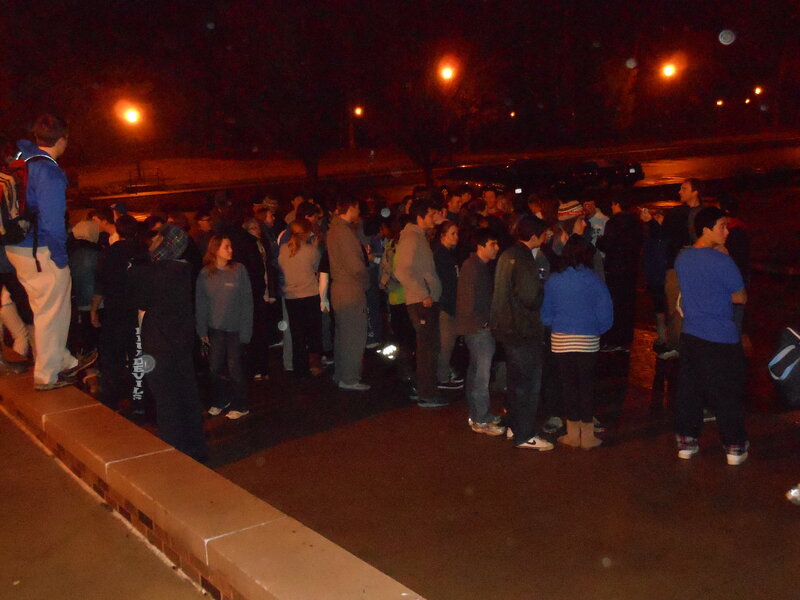 So we sang as well as anybody could sing at 5:30 in the morning and were on our way. The extra half hour of grace might not seem like much, but it actually made a huge different. Daytime hours pick up once again on weekday mornings at 7:00 a.m., which means that by the time we had to be back in the tent, only one member of the tent had to be present. This gave the rest of us an opportunity to leave and catch up on some much needed sleep in our beds. Our daily tent schedule doesn’t start until 9:45, assuming that at least one group member that slept in the tent in the night before will still be asleep or hang around in the morning. Two members of our group volunteered to stay behind and go straight from the tent to their 10:05 class, which gave the four of us the opportunity to head back to East. We loaded up into my friend’s car and headed back. Apparently they tell me that as my friend started to back out I suggested we pull straight through the space, not noticing the giant lamppost sitting in our way in my half-asleep state. But I can’t be absolutely certain, I was really tired so I don’t remember much. After arriving back in my room to a surprised roommate (who got off of tent duty that night), I was able to snag a couple extra hours of sleep before I had to get up for my 10:05 class. Duke basketball never stops, but neither do classes, so it was back to the grind for me. PS- A special shout-out to my good friend Jacob Zionce for volunteering to cover someone and sleep in the tent on his 19th birthday. Now that’s dedication.